C-Line is proud to present a variety of products to meet your media storage needs. Our products provide you with everything you'll need to protect your diskettes and CD's. The CD Ring Binder Kit is a convenient, 2-inch D-ring binder with spine index label holder. Each insert pages features a non-woven material that cleans the CD every time you place it in the holder. The binder can hold up to 80 CDs with the possibility of holding up to 144 CDs with additional refill pages. Every page is protected with polypropylene material, ensuring the graphic stays on the CDs. Look no further; this CD Ring Binder Kit is the perfect product to organize, clean and store your CDS! Holds by DVDs. Not too big. works Awesome. CD's can't fall out. Transcript: Welcome to MyBinding.com. 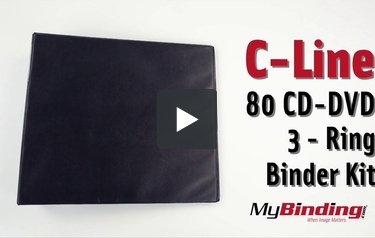 These are the 80 CD/DVD 3-Ring Binder Kit from C-Line. Welcome to MyBinding.com. These are the 80 CD/DVD 3-Ring Binder Kit from C-Line. For stellar organization and protection of your media discs, choose C-Line. This kit comes with a strong, 2-inch, D-ring binder and 20 CD holder sheets for 80 discs. With additional holder sheets, you can hold up to 144 CDs or DVDs inside the 2 inch binder. Each holder sheet can hold 4 discs, but most importantly they protect those discs. They’re made from archival quality polypropylene to prevent degradation and sticking to the disc’s graphic, and the underside is a non-woven material that actually cleans the disc each time you insert it into the holder. Get superior organization and protection with C-Line.